On the first day that Canadians are legally allowed to get high, stocks in Canadian marijuana companies did something perhaps unexpected: they went low. Shares in most Canadian marijuana companies were lower on Wednesday, a sign that the volatility that has characterized the space as an investment isn't going to go away now that the drug has been made legal for recreational use. 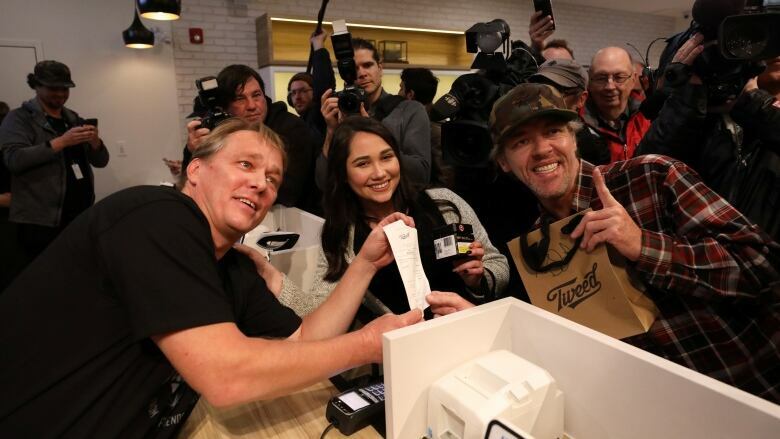 Cash registers are ringing up sales, in person and online, but the reaction from investors in Canadian cannabis companies was soundly underwhelming on the first day of legal weed. Shares in Canopy Growth Corp. fell out of the gate before see-sawing through the day. By the time the Toronto Stock Exchange closed on Wednesday, Canopy's shares were off by more than four per cent at $65.60. Edmonton-based Aurora Cannabis was off by as much as 10 per cent at one point before rebounding to close down almost three per cent at $13.55. Leamington, Ont.-based Aphria Inc. also slumped at market open before closing up almost four per cent at $19.34. High-flying Tilray Inc., which at one point was briefly the most valuable pot company in the world at $300 a share, was off by more than 10 per cent at just over $148.25 on the Nasdaq on Wednesday. Most of the smaller names were also down on Tuesday, marking a counter-intuitive two-day slide for pot companies just as their product became legal in Canada. To analyst David Kideckel, managing director at investment firm AltaCorp., the selling off makes perfect sense in the short term. "The cannabis stocks have been highly volatile over the last little bit so this isn't really taking me by surprise that we're trending down today and facing some downward pressure," he said. He's still a big believer in the sector over the long term, but after a meteoric rise over the past year he says it's to be expected for the market to take a breather. "It's really going to take time for the markets to see who the winners and losers are," he said. He suspects investors will give all the companies "a pass" on turning their hype into actual profits for the rest of 2018, but by 2019 they will demand results and anyone who falls short of sky-high expectations will be punished for it. "We haven't really been through a full cycle yet or a full quarter to see if there are companies going to actually meet their their forecasts." Others are a little gloomier on the sector. Chris Damas, editor of investment newsletter the BCMI Cannabis Report, was laying out the bearish case to his subscribers on Tuesday, and that was before Wednesday's selloff. "Some of the simplistic justifications for a half-trillion dollar market for cannabis worldwide are just that — simplistic," he said. Market leader Canopy Growth showing weakness is "a signal that we are at or near a market top in the sector," Damas said. In recent months, big alcohol companies have moved to link up with many of the big cannabis names, in particular Constellation Brands' $5-billion investment in Canopy, and rumoured interest from companies like Coca-Cola and Molson Coors in other pot names. But Damas thinks those deals won't prove particularly lucrative in the long run. "I would continue to bet on medical cannabis being a successful program in Canada, with export potential," Damas said. "But not at these stock prices." Analyst Stuart Rolfe at Veritas Investment Research Corp. is the only analyst to have a "sell" rating on all the major companies, which means he thinks their stocks are way too high and due for a fall. In a recent note to clients, Rolfe said he thinks the industry is over-estimating demand for its product, and making the flawed assumption that the black market the legal companies want to compete with will simply disappear. "All of these factors lead us to conclude that Canadian cannabis valuations are at risk of falling precipitously," he said. "The tail end of the cannabis rainbow may be approaching much faster than investors realize."